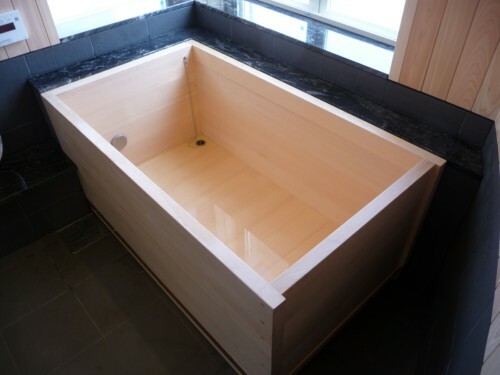 Blog | Bartok design Co. Blog – Page 17 – Bartok design Co.
First of all thanks again to the architect who commissioned us this hinoki bathtub, and congratulations for his superb architectural design quality! I feel that the rough and natural feeling of the knotty wood complements perfectly the classy shine of the glass mosaic walls. His work was featured in Interior Design Magazine, I recommend to see also the picture gallery for a full overview of the house. Yes, by popular demand we can now supply a spherical drain plug! It is cool and can plug the drain socket in direction. It should fit your 40A type drain fitting. 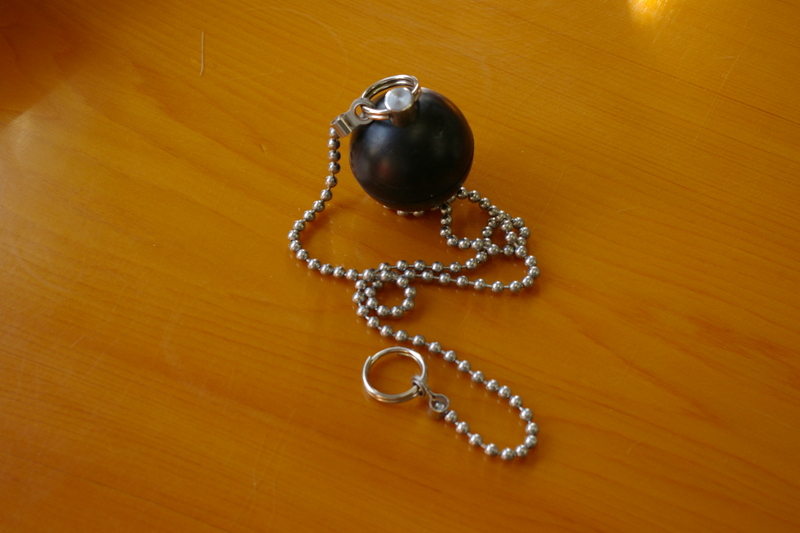 The ball is in durable chemical rubber: after many years it may shrink slightly but will not ovalize. The chain and ring are in stainless steel. or, in case you want to purchase the plug only, refer to the prices below and contact us by email. 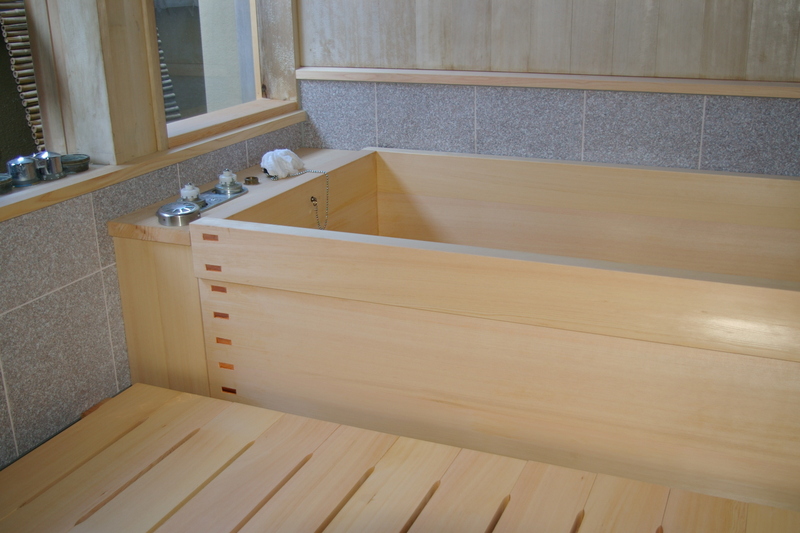 Here are some pictures of a hinoki tub installed in a house in Tokyo. After the wall is finished, the tub is placed. Note the cuts in the ledge to drain the water accumulating on the ledge. Few years ago we shipped a tub to Hawaii. 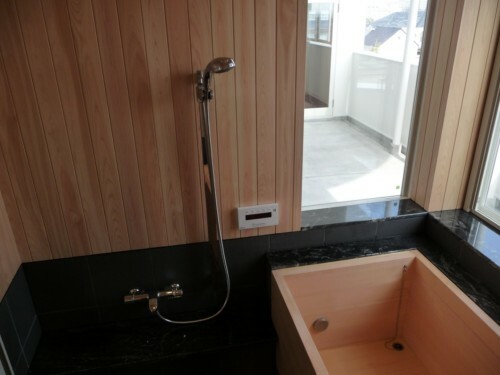 I remembered they were planning to finish the area around the tub with river stones. Yesterday, a client was looking for a similar solution, so I tried to check the homepage to see if they had a picture of the tub installed. 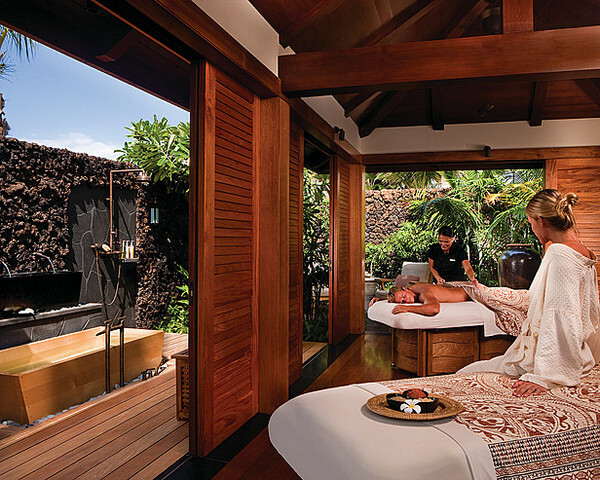 Copyright of the picture by Four Seasons Resort. 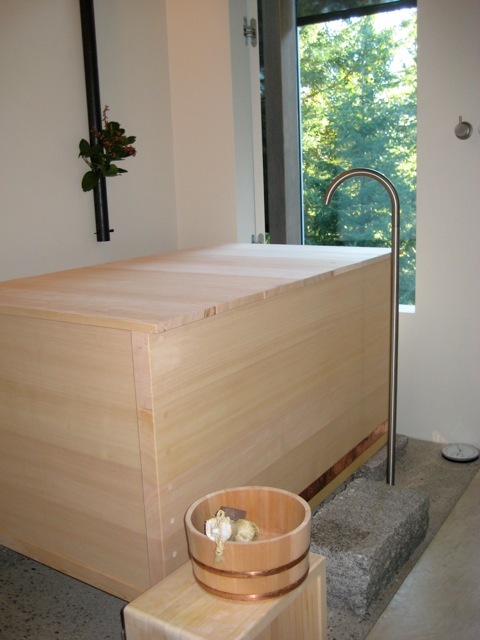 This is a beautiful picture of a tub we made a couple of years ago. 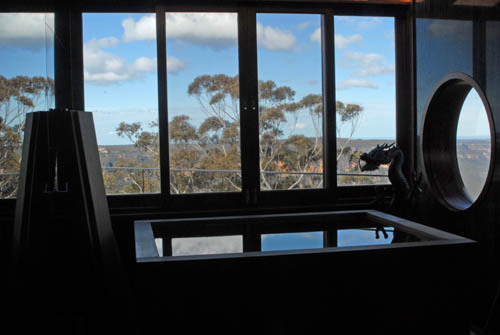 The scenery from the window is breathtaking! Also, the owner collected with patience and refined taste many other japanese items (we helped with supplying the lighting fixtures and door knobs) to create an authentic interior. Dear friends concerned about the 3/11 quake in japan, let me share with you a webpage. But I especially like the section called Murmurs, messages, words. which is constantly updated on the top page. It collects testimonies, messages of encouragements sent by tweeter or other instant messaging services. They are words of hope and heartwarming short poems, tiny but real gems in the mud of the tsunami. Yesterday my 2 year old son wend to the door and started to wear on his shoes. What are you doing? – I asked. I am going to arrest (capture) the earthquake – he answered. 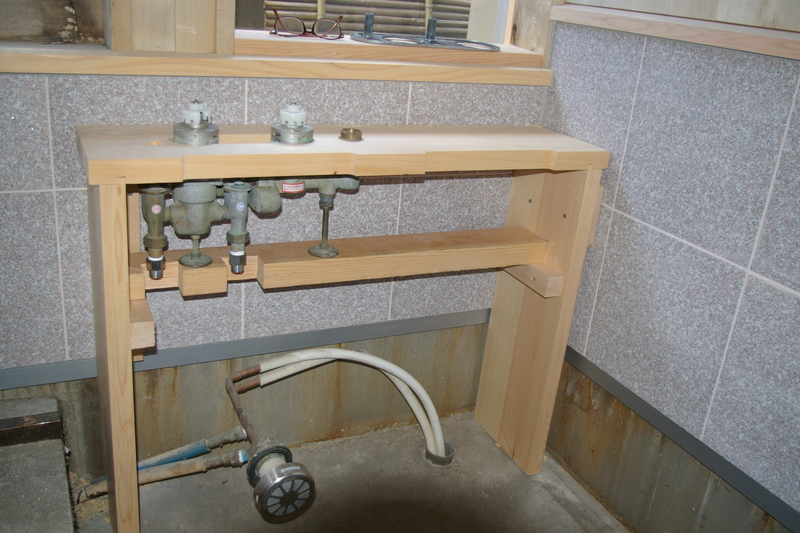 When Chubu Electric Power stated they will transfer a part of the power to the troubled Kanto Electric, my grumpy father who usually keeps the TV, heater and lights of the ground floor on all the day, started without a word to unplug all utilities. I was a little touched seeing him do so. Japan s great. Also the private sector officials, in trying to help everyone. I heard that even the Yakuza is giving availability to several trucks to transport goods to the Tohoku region. Until recently I was not proud to be a japanese. But Japan is a great country. I’m honestly impressed. Fellow japanese, let`s do our best! Working part-time as a waiter. The shop was almost full and when the earthquake happened, we had them evacuate for safety. I started to think “today we had many eat-and-flee customers” when one by one almost all clients come back to pay the bill. The few people who could not return, come back today purposely to set their bill. Japan is a great country! People who lost everything not only need compassion. They need a reason to smile. I will add some more later on. 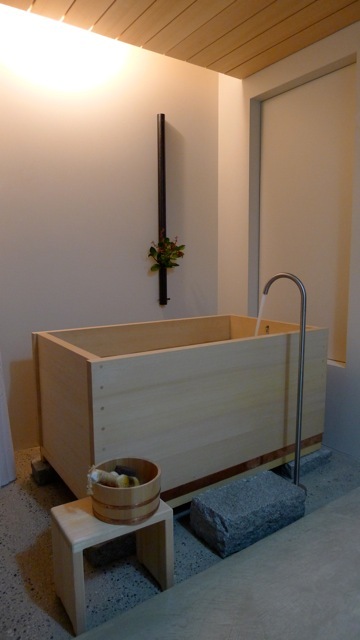 Here are some pictures of a tub installed in a private residence near Osaka. It is actually a new building designed by Torrini. 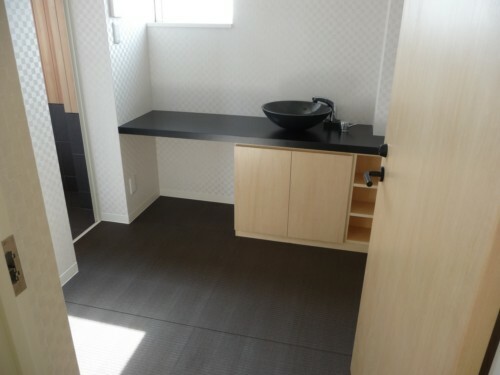 Here is the powder room with tatami-like vynil tiles. 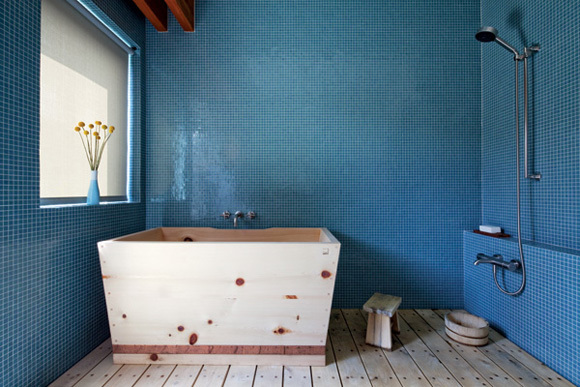 The bathroom has no-slip warm-touch gres tiles produced by INAX. 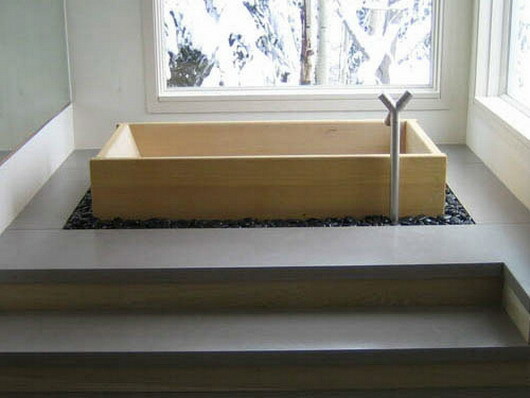 The ledge is in marble and the wall upper section is finished in hinoki wainscoting. Perfect for contemplating the sea-view from the window! We continue to receive many kind emails of condolence, empathy, encouragement. Thank you for this heartful thoughts, the japanese need it. We appreciate your concerns, but do not worry too much, the japanese will stand again. nakinasai warainasai itsu no hi ka itsu no hi ka hana wo sakasou yo. Come on, Cry! Come on Laugh! One day, one day, let`s make the flowers bloom. We appreciate all your kind mails and phone calls and feel sorry to make you worry. Actually we are far from the areas of destruction and did not suffer any damage. I am also astonished to look at the TV: they look like images from another country as there was no shake or tsunami in western japan. Due to overloaded telephone lines I was able to contact our warehouse in Chiba only on sunday morning, 36 hours after the quake. The tremblor was strong but fortunately no damage to people and equipment. Now the nuclear emergency is giving some serious concern. I cannot be optimistic but there is no point in panicking and I am trying to collect unbiased data and act rationally. 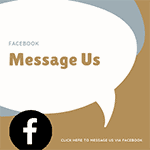 I am sharing some thoughts and founds on my facebook profile. About the work, we are fully operational, all our material is safely stocked inside and we are at your disposal for any question. Actually, we try to keep busy to counteract the hypnotic effect of the round the clock TV news…! Lastly, let me share with you the link to some donation sites. These people lost family, property, work. At least let`s return them some hope. Happy New Year! I hope that all is going well for you in Japan. 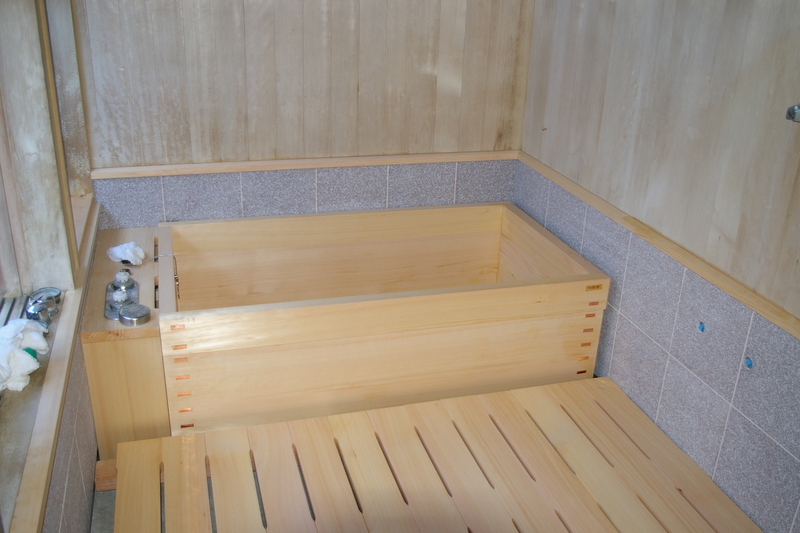 Here are a few photos of our hinoki tub installed. It is a joy to use!!! Now you need to make a journey to this part of the world to see it in person! Thank you so much to you, Wada-san, and anyone else who assisted in making or getting it ready to ship. It was a long journey to get it in place and I am very happy we did it. 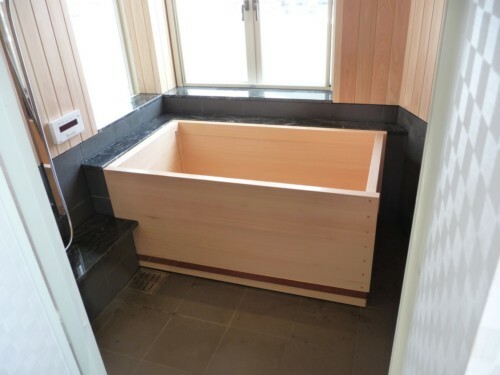 To hear that the client is satisfied and enjoying the tub is is for us the most important thing and is the source of more energy and enthusiasm in continuing our mission of introducing the art of japanese soaking baths Worldwide!